Hello everyone! 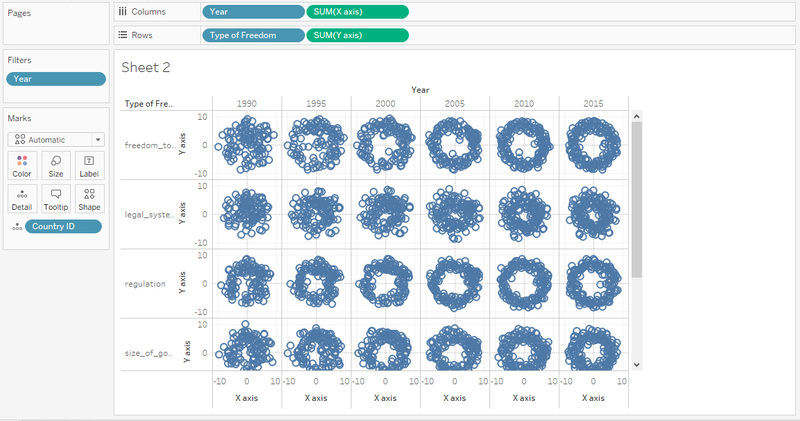 My name is Adolfo Hernandez, I’m a Data Visualization and Tableau geek (my Tableau Public profile here). 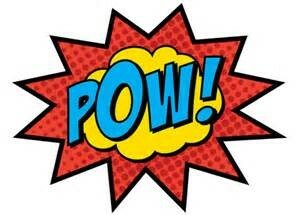 I’ve been kindly invited by Ken to write this guest blog post about how to create the POW chart. This is my first blog post ever and I’m very excited about it, thanks Ken! 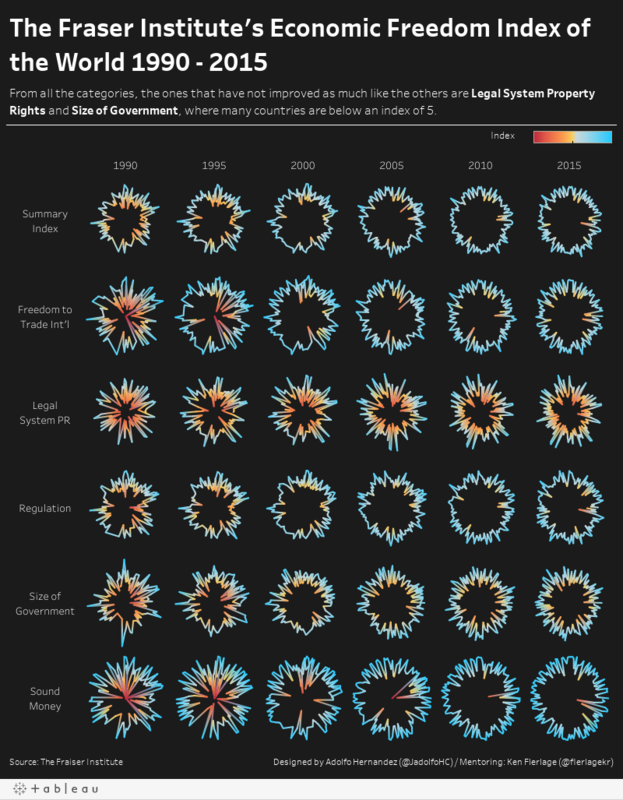 I posted my viz on LinkedIn and several data lovers were asking for a tutorial on how to construct this viz, so here we are and this is how it’s done. 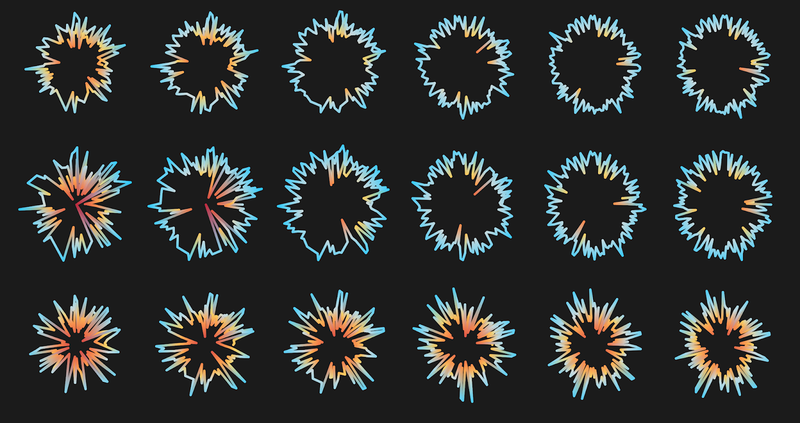 Also, we’ll need a helper dataset, this will come handy when we create the viz. 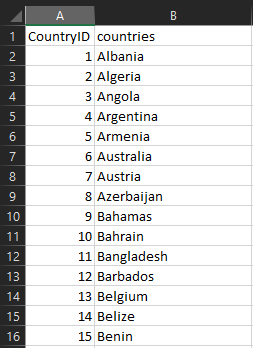 I just copied the “countries” column to a new sheet, removed the duplicates, and inserted an “Country ID” column that goes from 1 to 159—the total number of different countries in our dataset. This data will be later used to draw the circular shape in our POW chart. 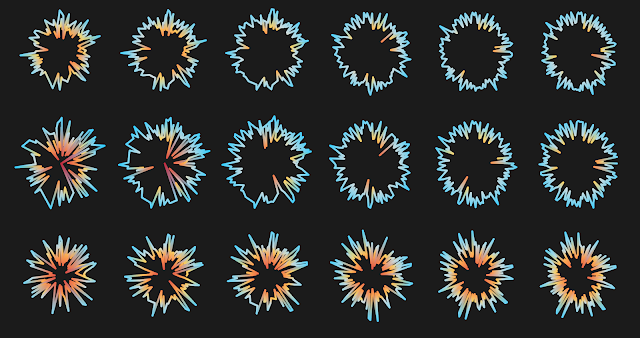 Maybe all this data prep could have been done in Tableau by using calculations but I’m more inclined to understanding what I’m doing, even if there are more steps involved, over elegance in the code. If you know how to do all these steps in Tableau please do so and share! This “POW” chart is basically a circle shape formed by the quantity of [Countries] we have in our data (159 points), and each point has a different radius length that is given by the [Index] variable, this variation on the radius give us the POW effect. 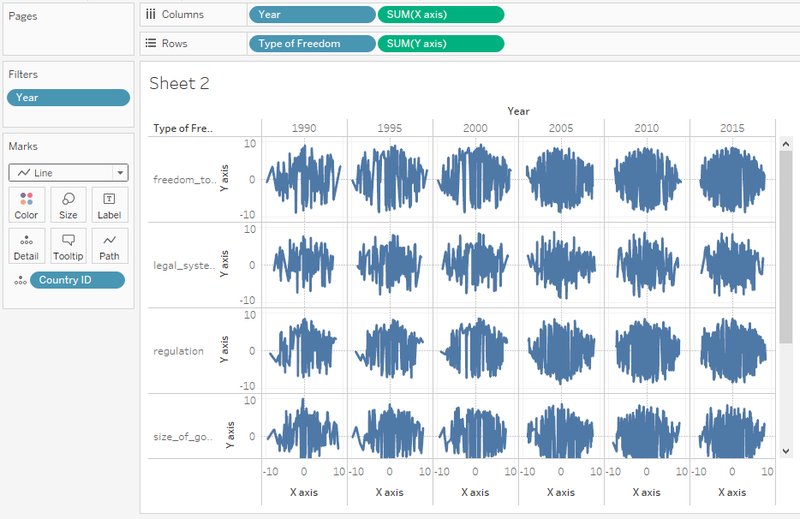 By the way, when I mention Index I am referring to the score each country gets on the Type of Freedom, which is the study case of this particular dataset, I’m NOT referring to Tableau’s INDEX() function so be careful not to get confused by this. 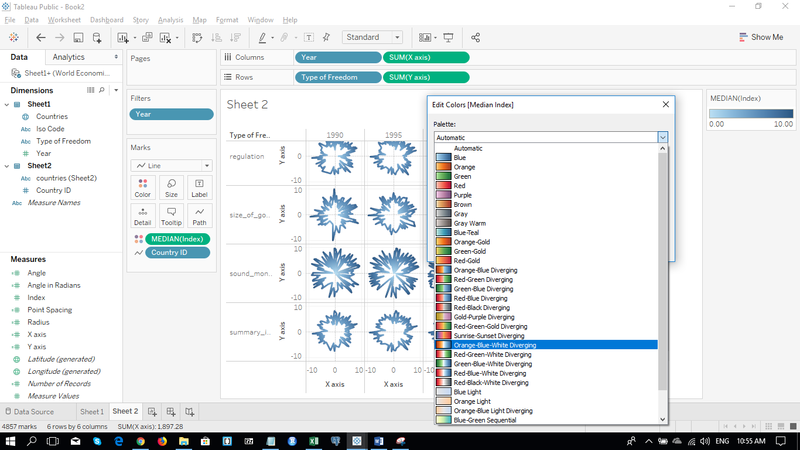 First we load our Excel file in Tableau and make a Left Join using our main dataset and our helper dataset. 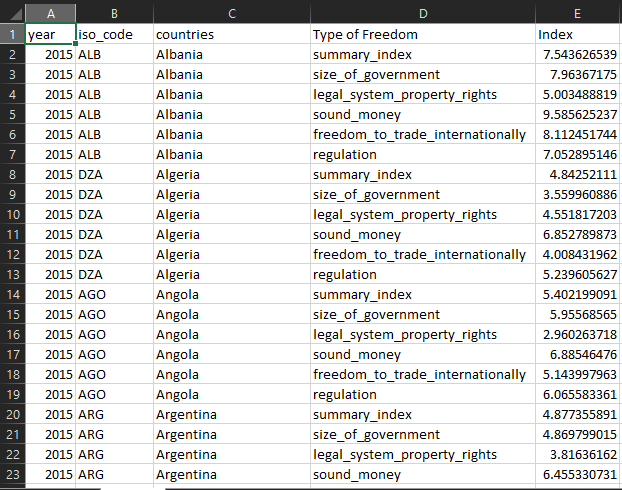 Now you should have two extra columns the “Country ID” column and the “countries (Sheet 2)” column. 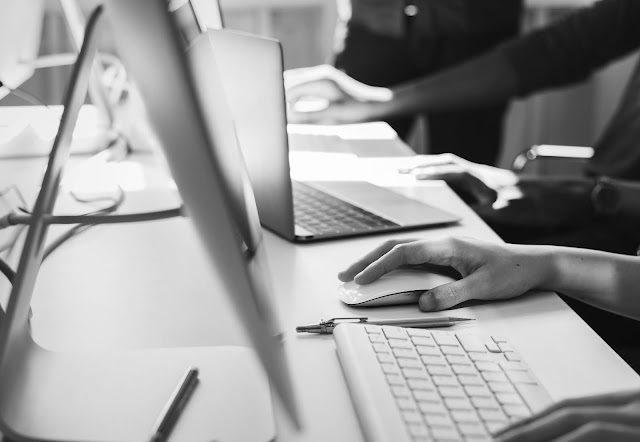 Hide this last one to avoid variable cluttering. NOTE: An inner join would have worked to but I wanted to prevent the filtering side effect that inner joins might cause. Now we will follow pretty much straightforward the wonderful blog post by Ken, Beyond "Show Me" Part 2:Trigonometry. We will just replace some content of the calculations to adapt it to our data. OK, we’re done with the data prep and the calculations, now up to the fun part, to draw our POWs! 1. Drop [Year] on the Filters card, change it to discrete and select years: 1990, 1995, 2000, 2005, 2010 and 2015. 2. Drop [Year] on the Columns shelf. 3. Drop [Type of Freedom] on the Rows shelf. 4. Drop [Country ID] on the Detail card. 5. Drop [X axis] on the columns shelf. 6. Drop [Y axis] on the rows shelf. Now move the [Country ID] pill from the Detail card to the Path card and done! I selected Orange-Blue-White Diverging. Finally, change the workbook background to black, do some cleanup and formatting here and there, and finally we have our POW chart! Do you like it? Please leave your comments below and let me see your creations by tagging me either on LinkedIn or Twitter, I want to see what you come up with! Thanks again to Ken for inviting me to this guest blog post, for the guidance and patience and most of all for his encouragement and support, THANKS KEN!